Renal disease is a major complication in diabetes and one of the major causes of end-stage renal failure. Clinical Approach to Renal Diseases in Diabetes highlights the development of diabetes mellitus, renal involvement and other comorbid conditions along with the latest therapeutic regimens. 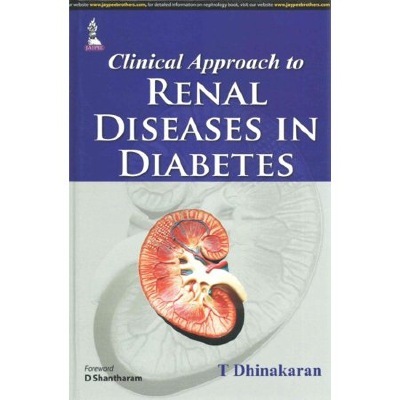 This book is comprised of 12 chapters, which discuss a range of topics in detail including diabetic kidney disease, risk factors for diabetic nephropathy, pathophysiology of diabetic nephropathy, microalbuminuria in diabetic nephropathy, diabetic nephropathy treatment, hyperglycaemia control, treatment of hypertension, proteinuria therapy, diabetic nephropathy and cardiovascular morbidity. The preventability of diabetic nephropathy is debated, including the prevention of microalbuminuria through renin angiotensin system, inhibitor therapy and the role of biomarkers in diabetic nephropathy. Clinical Approach to Renal Diseases in Diabetes covers all aspects of renal involvement in diabetes, providing a useful resource to general practitioners, urologists, nephrologists and diabetologists. Key Points Comprehensive guide covers all elements of renal involvement in diabetes Includes debate on the preventability of diabetic nephropathy 45 full colour illustrations and tables.